Head lice infestation can be super irritating and embarrassing. Head lice infestation is not just disgusting but it is equally harmful for your hair. I have seen people denying the fact that they have head lice and that shows how embarrassing it could get. Many individuals try to hide the fact that they have head lice mainly to avoid humiliation, so they often shy away from asking for help from others to get rid of head lice. But honestly, getting rid of head lice is not a big deal, especially if you are serious about it. If you have found signs of head lice infestation in your hair and wondering about how to get rid of it easily and naturally at home, then here’s the post you can’t afford to miss. Today I am sharing the list of 11 proven and tested natural home remedies to get rid of head lice fast and easily. If you are embarrassed to talk about head lice, then worry not, as you can try these remedies and get rid of head lice in no time, on your own and at home. There are many who do not feel like visiting a doctor to get proper advise on how to deal with head lice. Instead, they depend on the commercial head lice removal products that are readily available in the market. Well, I completely understand your embarrassment but you must agree that using these chemicals found in the market products is not a wise decision. They may damage the hair and make the hair very dry and lifeless. Thankfully, I have got better solutions to this problem and the most interesting thing is you do not also have to ask anyone for help. You can treat the problem of head lice on your own using all natural ingredients. 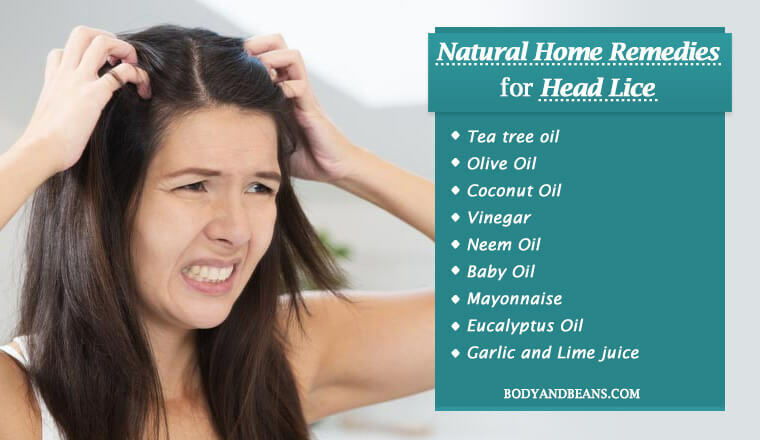 So, if you are tired of head lice and looking for easy and natural ways to get rid of it, then continue reading this post, as I sharing various remedies on how to get rid of head lice naturally at home. But before we get in to the remedies to get rid of head lice, it is important to understand why do we get head lice infestation? Well, that’s what I am discussing right here, in the next section. What are the main causes of head lice? You get infected with head lice mainly when you come in close contact with a person already infected with lice. Even if head lice do not have wings, they can crawl very fast, leading to fast spreading of them even in case of slightest contact. So they can easily travel and spread from one head to another quite fast. Secondly, the head lice can breed quite fast, so once a few of them enter your head, they can multiply in no time and soon your head will be filled with head lice. And that’s why it is best to start the treatment from the very beginning so that you can get rid of the head lice really fast. Moreover, the more the number of lice in your hair, the more will be the time taken to completely get rid of them and who knows, one or two may still remain and cause head lice infestation some time later. However, at first, you need to try and identify the problem quickly and then you can use the home remedies to get rid of head lice that I am sharing below. Tiny tan or yellow dots on the shafts of your hair strands which possibly could be the lice eggs or the nits. Well, there is no doubt that having the problem of head lice is disgusting, so let us start the discussion on the home remedies without further delay. So that whenever you identify it, you can easily start the cure using the available natural ingredients to get rid of it from the very beginning. When it comes to dealing with nasty head lice, there is nothing better than using natural home remedies. I personally prefer natural ingredients over chemical based hair care or skin care products and dealing with head lice is no exception. Today I am happy to share these remedies with you and if you are struggling in removing head lice, then may be its worth trying some of these remedies. These natural remedies are fast, effective and easy to apply. Try these easy to apply remedies with conviction and positivity, and you will be able to get rid of head lice in no time. The first and most widely home remedy to remove head lice is tea tree oil remedy. Tea tree oil has got ovicidal and insecticidal effects which make it very effective in killing the lice and its eggs. Tea tree essential oil is also considered to be the best natural lice repellent and thus it helps in prevention of head lice much effectively, studies are a proof of it. In one of the experiments conducted in 2012, tea tree oil was shown to give 100% results and so its effectiveness against the head lice can never be have tried everything without much success, it’s time you try the famous tea tree oil remedy for head lice. The procedure of using tea tree oil to remove head lice is pretty straight forward. Before going to sleep, take adequate amount of tea tree oil and add it to a carrier oil like the coconut oil and then apply it all over your lice infected scalp. Now, cover your pillow with a towel and go to sleep. The next morning, comb your hair properly to remove all of the dead head lice and the nits. If you continue this for 3-5 days, you will be able to get rid of head lice easily. If you are not comfortable putting mayonnaise on your scalp, then you can consider using the olive oil, as it is the perfect alternative to using mayonnaise remedies for head lice. This is because, just like mayonnaise, it also suffocates the adult lice and eventually kills them. And, as far as the nits go, it helps in easy sliding off them from your hair when combed using a nit removal brush. The remedy is all the same as that of mayonnaise. Take adequate olive oil and apply generously on your scalp. Wear a shower cap after that and keep it nightlong. Next morning comb your hair properly to remove the dead lice and then wash your hair properly using lukewarm water. With 2-3 applications of this remedy, you will be able to get rid of head lice completely. Eucalyptus oil being a strong fumigant is very effective in killing the head lice and is hence one of the best home remedies to remove head live. Studies have shown that eucalyptus oil has been beneficial even against the head lice which were resistant to chemical treatments, so the effectiveness of this oil against head lice can never be underestimated. Eucalyptus oil in itself is great but I want you guys to use olive oil along with it to get maximum benefit in removing head lice. Take around 15-20 drops of eucalyptus essential oil and mix it with 2 ounces of olive oil and then apply the mixture on your scalp before going to bed. Cover your hair with a shower cap and keep it overnight. Wash and comb your hair next day thoroughly to remove the dead lice and then rinse your hair. Repeat the eucalyptus essential oil remedy if needed. I know garlic on your hair may sound yucky but trust me; garlic is one of the best home remedies to get rid of head lice fast and naturally. The simple reason behind it is head lice hate strong aroma and so it is impossible for them to tolerate the strong pungent odor of garlic and they eventually suffocate and die. So, using the easily available garlic is a good option for you to try. All you need to do here is take around 10 garlic cloves and grind them into a paste. After that, mix around 3 tablespoons of lime juice in to it. Now, apply the mixture directly all over your scalp. Keep it for half an hour and then rinse it with hot water. Repeat the remedy as required. For those who care about the quality of the hair too much and does not like experimenting much with the hair, for them coconut oil is the beast choice. Coconut oil is highly effective against head lice as well as is safe for the hair in general. Besides suffocating them to death, coconut oil also does not let the nits or the eggs to remain attached to your hair, which, in turn, terminates their life cycle. The nits also come out of the hair with normal washing. Henceforth, this is a great remedy for head lice removal. Take adequate coconut oil and warm it. Now, apply it generously on your scalp, massage for few minutes and then cover your hair using a shower cap. Keep for at least 2 hours and then comb your hair using the nit comb to remove the dead lice. After that, shampoo your hair. This is a great remedy for head lice removal and if used 2-3 times weekly, then it will help you eliminate head lice completely. White vinegar is popularly known as an all-purpose cleaner and it can help you to clean your hair off all the head lice as well. Well, vinegar is certainly great in fighting head lice infestations because the acetic acid present in it helps in loosening the strong bond between the nits/eggs and your hair making it comfortable for you to remove them with normal washing and proper combing. You need to dilute adequate vinegar with enough water and then apply the mixture on your scalp. After that, wrap your hair and scalp using a towel and leave it for at least half an hour. Then remove the towel and start combing your hair properly to remove the eggs and the lice. After that, rinse your hair thoroughly. Repeat the remedy in case you need to. You may use apple cider vinegar as well in place of white vinegar if you want to. It also works equally well in removing head lice. Neem oil is one of the best home remedies to get rid of head lice fast and naturally. The reason why it is effective is because it kills the lice by blocking the air passages of both the adult lice and the nits. It is also scientifically proven to be a complete cure for head lice and so it is worth trying. To gain the maximum benefits in removing head lice, it is best to use neem oil along with your shampoo. For that, all you need to do is to mix the neem oil in your everyday shampoo and then use it to rinse your hair and scalp. After that, use the nit comb to brush your hair properly. Do it regularly until the head lice are completely gone. You may be amused by knowing that you can actually use the baby oil to get rid of head lice completely. The main reason why it is so effective in removing head lice is because it suffocates them by restricting their air passages, which ultimately kills them. In addition to it, baby oil also makes your hair slippery which causes difficulty for the eggs to remain attached to your hair shafts, which, in turn, can be easily removed by normal combing. At first, take enough baby oil and massage it on your scalp for a few minutes. Then cover your hair and scalp using a shower cap and leave it overnight. Next morning, use nit comb to remove the eggs and the head lice from your hair. After that, you can shampoo your hair normally. Repeat the remedy few more times until you get rid of head lice completely. Not many of us are aware, but mayonnaise is very effective against head lice and so, it is rightfully included in the list of home remedies to get rid of head lice fast and naturally. The reason it works in removing head lice is because lice gets suffocated by the strong odor of the mayonnaise and eventually they die. Mayonnaise will not just kill the adult ones and the nymphs but will also kills the eggs. So, in short, it gives you a complete cure of the head lice problem. This remedy is also best used while going to sleep. Take adequate mayonnaise and apply it generously all over your infected scalp. Wear a shower cap after that and then go to sleep. Continue this for a week to make head lice completely gone. One of the effective home remedies to get rid of head lice is by using hot hair. Blowing air into your hair is one safe treatment to eradicate head lice infestations because lice are unlikely to evolve resistance to it. In fact, studies have shown that if you use a hair dryer and blow your hair, it will give you around 47.2 % success in eradicating lice and around 47.5% success in decreasing the hatching rate of the eggs. So, if you have a hairdryer at home, you surely cannot give this remedy a miss. The process is similar to how you blow dry your wet hair to dry it. You just need to do it at least 30 minutes if you want quick results. Repeat the process if needed. Petroleum jelly is not a natural product but it is a popular home remedy for head lice and is proven to cause maximum lice and egg mortality when compared with the other natural home remedies. Since, petroleum jelly is a widely used product and almost every home has it, I thought of including it in my list of home remedies to get rid of head lice fast and naturally. The reason why petroleum jelly is so effective is because it has the ability to create an uninhabitable environment for the head lice which will suffocate them to death. Before going to sleep, rub some petroleum jelly generously on your scalp and cover it with a shower cap. Let it stay nightlong and then comb your hair using a nit comb to remove the dead head lice. Make sure before combing, you apply some baby oil on the nit comb and then comb it. This is because it will enable you to remove the petroleum jelly from your hair along with the dead lice. Then shampoo your hair properly. Use this remedy every night till you are able to remove the head lice fully. The above-mentioned home remedies to get rid of head lice fast and naturally are great and very effective in removing head lice. But, if you can prevent the occurrence of head lice, it is even better. After all, head lice are very disgusting thing and having these creepy beings in our hair is a nightmare for us. So, you can consider the following tips for prevention. Keep your hair clean all the time. The sheets or the clothes of the infected person must be washed with hot water and an enzyme-based detergent. Over to you: which is your favorite remedy to remove head lice? Having head lice is undoubtedly disgusting and it is a common hair problem that we face some time or the other especially when we have to come in close proximity with various people on a daily basis. Moreover, if any one of the family members gets infected with head lice, there is high chance that it will spread to other family members very quickly. Hence, it is best to stop the head lice infestation and if it has already infested, then take measures to get rid of the problem fast. Most of us rely on the market-based products to remove head lice, but what we fail to realize is that the chemicals in those shampoos can ruin your hair. So, for your safety as well as for getting best benefits, I believe that natural remedies should be your priority. We have already discussed about 11 of the best home remedies to get rid of head lice and I have myself tried a few of these. These remedies are not just effective but are very cheap as well as natural and easy to apply. Using these remedies you can easily remove head lice completely. All you need to do is to apply the ingredients generously and. However, the time taken to completely get rid of head lice will depend on the level of lice infestation in your hair and scalp. If you could identify the problem at the very beginning, it will go just by one application. But if the lice are too many in number, then you may have to apply the remedies till the time you feel that the head lice are completely gone. Also, I believe that prevention is always better than cure, so I have mentioned some of the tips on how you can prevent the head lice infestation. Check them out and try your best to protect your hair. Are you struggling with head lice problem and wondering if there are easy ways to remove head lice naturally? Thankfully, there are remedies available and I have discussed top 11 of them. All that you have to do is try it out and get rid of head lice completely. And if you are aware of any other ingredient or home remedies that may help in removing head lice naturally, then feel free to share it. I will be happy to include the remedies in this post. And if you have used any of the above remedies to remove head lice, then let me know which one worked well for you? Until then, stay safe and protect your hair from head lice as much as possible.